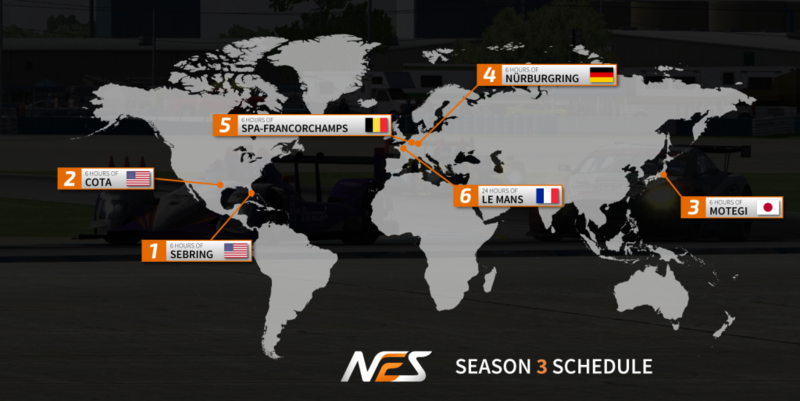 NEO Endurance is proud to announce the provisional schedule for season 3 of the NEO Endurance Series (2016-2017). The season 3 schedule has six rounds, one round less than season 2. and the NES will have an Asian debut, in Japan. The NES showed to be popular within the iRacing community right from the start. The third season of NES will start in the fall of 2016 and will feature six rounds in four continents. The eight hour race length has been removed and replaced by a 24 hour race, at the end of the season. The other five rounds will be six-hour races. An other significant change on the schedule is the debut in Asia. For the first time in NEO’s short history, a NEO event will be held in Japan. Season 3 will start in the US with the traditional opening round at Sebring International Raceway on October 16th. The second race will be, as traditionally, at Circuit of the Americas on November 13th. This track has proven to create some exciting racing. The third round of the season will be held a new track for NEO Endurance: Twin Ring Motegi. This race will be held at December 11th. With the possibility to share pit stalls now, it opened up the possibility to have a NES race at this Japanese track. “We are happy to introduce a new venue in the NES3. Before we were limited in the number of tracks to choose from because of the limited pit stalls available. Now with the pit stall sharing feature, this is not a problem anymore,” said Niel Hekkens, co-founder of NEO Endurance. The second half of the season will be completely races in Europe. The first season of 2017 will be at the Nürburgring. The penultimate round of the season will be at Spa-Francorchamps. This iconic track will be ‘dress rehearsal’ for the teams and drivers, leading up to the big finale: the 24 hours of Le Mans! Yes, NEO Endurance will organize their first ever 24 hour race and it will be a part of NES3. The season finale is a collaboration with Racespot and the support series Gathering of Tweakers Endurance Series. The NES teams will qualify automatically for the finale and the top three, of each class, from the GES will receive an invite as well. Exact details regarding Le Mans are still being discussed and will be published soon. Racespot and NEO will continue their partnership in season 3. All 6 races will be broadcasted live, from start to finish, by Racespot. Niel Hekkens said: “Racespot is the obvious choice for us. We have a good relationship with them and they are simply the best sim racing broadcast team.” For more information about Racespot, go to racespot.tv. ** Subject to change, depending on the availability on the track.